These socks were a work in progress before we left for our trip, and I finished them off when we returned. 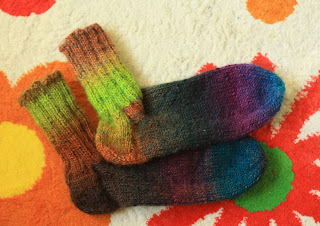 In these (unlike these), the Drops yarn's colour pattern surprisignly decided to actually almost match in both socks. Shock horror! I originally knit these for myself, but as I already got the wonky ones, I decided to brighten my boyfriend's day with them.